Feel embarrassed by visible fuzz on a date? ZEWEI Portable Facial Hair Remover is here to help you. ✔Safe on all skin types and tones, working great on your upper and lower lip, cheeks, chin and neck. ✔Anti-allergic blade design cuts hairs from the root fast and quickly, with no pulling and will not cause coarse pore. ✔Portable size for easy carry. You can put it in a bag or pocket and take it with you when traveling. ✔Powered by one AA battery (not included), it can last up to several months of daily use. ✔Waterproof and easy to clean, just take off the cutting head and clean it with running water or a brush. 1. Open the battery compartment and put into one AA battery. 2. Turn on the facial hair remover and put it close to your face and start running. 3. Take off the cutter head When finished. 4. Clean it with the supplied brush or directly wash it with running water. 5. Dry the cutter head and facial hair remover body with a piece of towel. 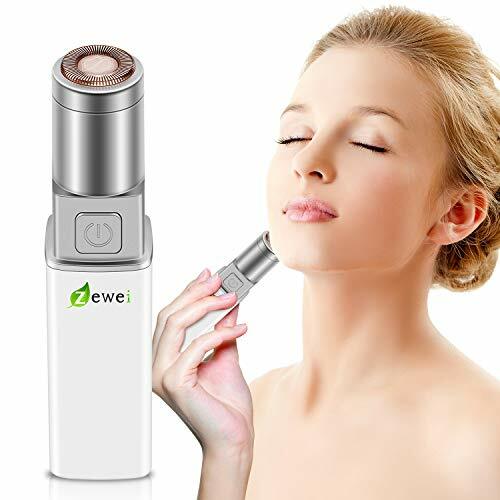 Remove All Unwanted Fine Hairs: ZEWEI hair remover is designed to gently remove fine, downy fluff and even coarse hair on your lip, cheeks, chin, arms and legs, safe and painless, like the breeze blows through. Leaves your skin hairless and smooth without giving you any stubbles, nicks or redness. Close Cut Blade System: Works with stainless blades hidden in cutter head, it won` t touch your skin directly but can cut hairs from the root smoothly and quickly, with no force pulling, zero harm to the pores. Not like permanent hair removal or wax removal, there is no redness and irritation with using our hair remover. 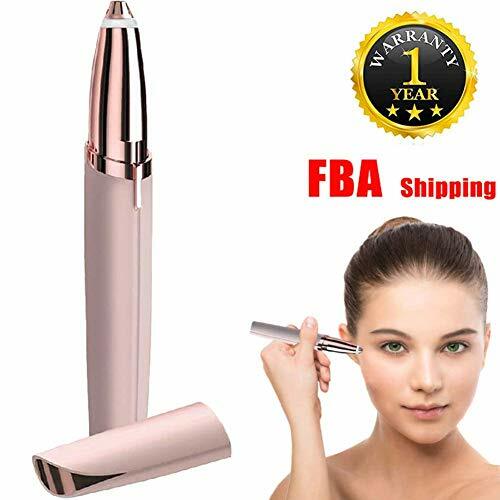 Portable & Stylish Design: This mini facial hair remover is designed like a lipstick, which can be fit comfortably in either hand for total control, or slips easily into your beauty kit during a party, traveling or business trip. Keep your face and body smooth anytime and anywhere. Super Long Lifespan: Adopt total newly electric machinery of more sufficient power. 1 AA battery can operate for several months if 5 min at a time. Super long lifespan, just need to replace the battery when it’s dead. 30 days money back guarantee, 12-month warranty and friendly customer service. If you have any questions, please let us know and we will make it right. 4. Gently press the head of the unit flat against your skin. 5. The unit should not be on an angle. Proceed making small circular motions to remove unwanted hair. *Prior to first use, test The unit on a small area, if any sensitivity or allergic reactions occur, discontinue use immediately. Do not use your unit on sensitive or irritated skin. ✅ Painless Facial hair removal for women: Facial hair is a problem for women. When removing by traditional ways, it hurts. Till now,introducing the new golden standard facial hair remover. Remove hair instantly and painlessly,just seconds, your face will be very smoothly. ✅ Women lipstick facial hair remover: Faster and Easier. No painless any more.Built-in light to see it clearly to remove every single hair. it could be used for upper lip,cheek and chin. No nicks, burns or irritation, just perfectly smoothly. 1 AA Battery – Included. Hair Remover is an electric razor. It’s does not pull hair from the root, but cuts so close to skin without irritating. Removes Facial Hair Instantly and Painlessly from Lip, Chin, Cheeks; Removes Peach Fuzz. Instant and painless, no redness or irritation. 【SAFE TO USE】Removes facial hair gently and painlessly. Through the stainless steel protection net, the steelhead in our hair remover does not have direct contact with the skin, but cut hairs from the root fast and quickly. 【MINI POCKET STYLE】10.7*2.3*2.3 CM. 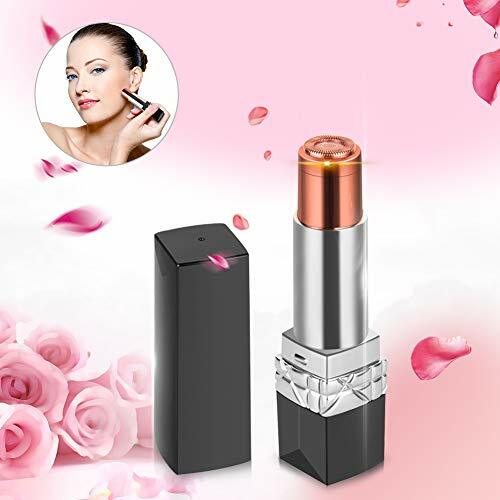 Exquisite compact appearance, easy to carry as your lipstick. Designed for elegance fashion ladies, which also makes it a considerate companion for your confidence and beauty. 【USB RECHARGEABLE】The hair remover is USB rechargeable battery. No need to spend extra money and effort to buy more batteries. ♥ Immaculate eyebrows are engineered to help you maintain perfect eyebrows. Helps remove excess hair and keep eyebrows. Aim at the smallest area to keep those perfect eye brows. ♥ Eyebrows are not long enough, waxing and pluckingare time consuming and painful! Innocent eyebrows are the perfect replacement for your painful scorpion. ♥ Built-in light: let you see your eyebrows hair clearly. ♥ Suitable for all skin types, even the most sensitive skin is hypoallergenic. ❤Frequently used：This brows shaver is a routine maintenance cleaning tool for regular eyebrow. No more tweezers! ❤Easy to use：The precision head is to be used on the top and bottom of brows and in between eyebrows. Not recommended to use to shape of eyebrows. ❤Package：environmentally friendly color box package contains a hair removal device and a cleaning brush. ❤Warranty：7 days within 24 hours service support.Just contact us if you are not satisfied. 7. 100% brand new and premium quality, If the women’s hair removal device is not work normally or any damage, we promise 100% refund you. 1. For superior result, use on hair in length or less. ❤ Painless Facial hair removal for women: Facial hair is a problem for women. When removing by traditional ways, it hurts. Till now,introducing the new golden standard facial hair remover. Remove hair instantly and painlessly,just seconds, your face will be very smoothly. 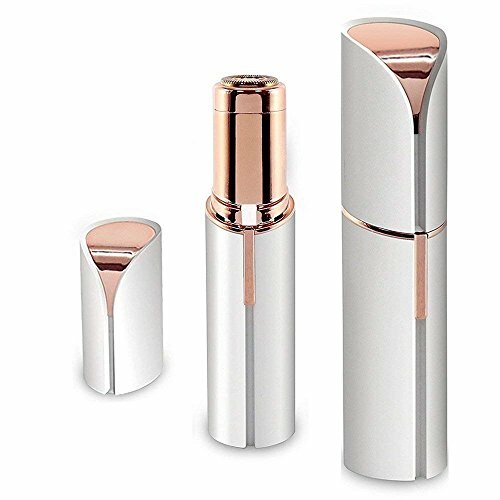 ❤ Women lipstick facial hair remover: Faster and Easier. No painless any more.Built-in light to see it clearly to remove every single hair. it could be used for upper lip,cheek and chin. No nicks, burns or irritation, just perfectly smoothly. ❤ Note: 100% brand new and premium quality, If the women’s hair removal device is not work normally or any damage, we promise 100% refund you. Now, you have an alternative to waxing that doesn’t irritate your skin. That’s right – a hypoallergenic way to remove unwanted facial and body hair. No one has to know what’s really in your bag! And, with facial hair gone, your makeup application is easy and flawless. 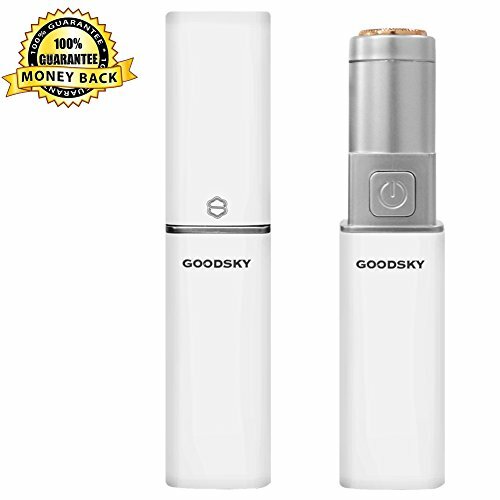 For flawless feel and a flawless finish – you can trust GOODSKY. PAINLESS AND ANTIALLERGIC：Are you scared at the mention of removing hair? You can’t stand the pain of waxing, plucking, and hurt of shaving with a razor. And our epilator, the fine stainless self-grinding cutter, ensures that the sharp blade will not pull your hair. Protecting lid and 3D floating cutter will prevent you from injury if skin bulges. You don’t have to put up with wax, plucking tools, razors, so you can throw them all in the trash. POWERFUL AND QUICK: Maybe you’re using several tools at the same time to remove hair: electric shavers, trimmers, scissors,etc. You’re tired of all the trouble and inconvenience. Our women razors can shave 3cm hair without having to trim short it first.（circling motion). It only takes a minute to complete the shaving of face. You don’t have to finish hair removal one day before you go out. Want to go out? All right, in a minute. PORTABLE AND BEAUTIFUL: Lipstick hair remover. It’s as small and delicate as lipstick. It’s easy to put in your make-up bag，wallet. An AA alkaline battery (included and free) can be used for 2 months. You can take it for a trip. You may also need to give a gift to your daughter, mother, wife, girlfriend, and best friends. 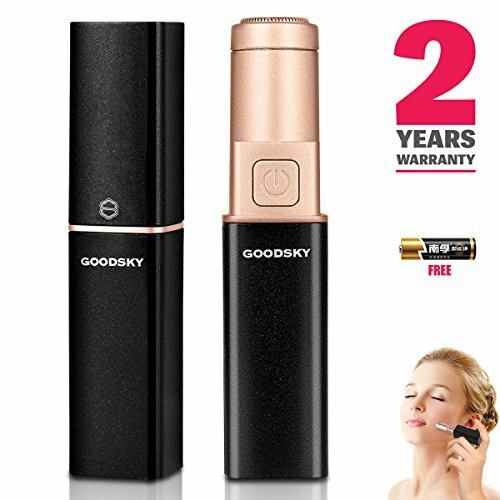 2-YEAR GUARANTEE: 2 years’ guarantee without risk.If you are not satisfied with our women’s facial hair remover, your money will be returned. Don’t worry. Don’t hesitate. Click Add to Cart to place the order. Awesome Design, Compactness, High-quality and High-tech Materials for Beauty Hair Removal Allows you Quickly and Remove Hair in the Most Sensitive Places! Body Painless Hair Remover has a coating of 18 karats hypoallergenic gold. A high-tech rotating cutter head in Face Hair Removal will quickly remove hair from the body, cheeks, neck, face, and lips. The steelhead in Fashion Hair Remover does not have any direct contact with the skin (does not leave cuts on the skin). Painless Remover is great for all types of Skin and Tones. Womens facial razor does not cause irritation, redness even for the most sensitive facial skin. Ladies hair remover is wireless, lightweight and portable. Hair Removal is suitable for daily use. 1 x Facial Hair Remover 1 x Brush for Cleaning 1 x Manual 1 x Stylish Gift Box The Perfect Gift Idea for Birthdays, Christmas, for mom, sister, wife, girlfriend or women you love! ONE YEAR WARRANTY, 30-DAY MONEY BACK GUARANTEE AND 24H CUSTOMER SUPPORT. For 30 Days After The Date of Purchase, Return It Receive A Full Refund for ANY Reason. The Finishing Hair Remover That You Purchase Today Will Be Automatically Enrolled In The Guaranteed Program. Please Be Assured The Purchase. 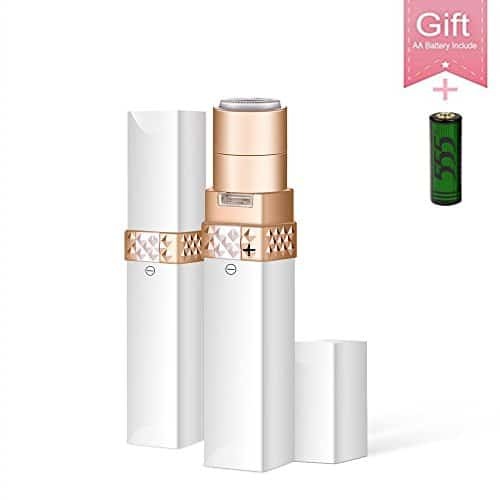 PORTABLE & STYLISH DESIGN – This Women Lipstick Facial Hair Remover is a Considerate Companion for You to Carry Around, The Mini Pocket Style is Specially Designed for Elegance Fashion Ladies. Make You Confidence and Outstanding at Anytime. HAIRLESS & PAINLESS – The Hair Remover’s Stainless Steel Blades Removes Facial Hair Instantly and Painlessly from Lip, Chin. Make Your Skin Look Smooth and Radiant Which is Gentle Enough to Use Every Day and Save Your Time or Money for Waxing. HIGHEST SAFETY STANDARDS – Recommended by Dermatologists. 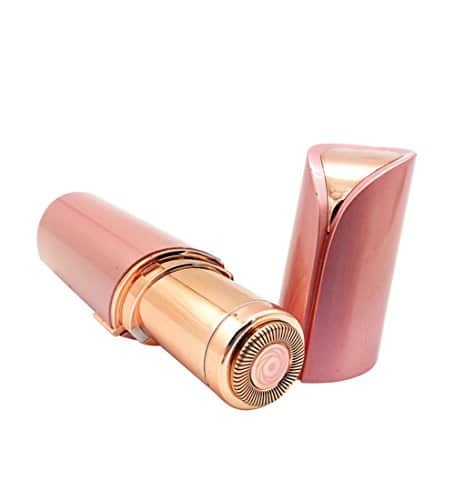 18K Gold-Plated Head is Hypoallergenic and Gentle on All Skin Types and Tones,It’s Practical and Beautiful; No More Cuts From Razors, No More Redness and Irritation. No Downtime Waiting for Regrowth. EXQUISITE FACIAL HAIR REMOVER – The High Quality Stainless Facial Hair Remover Rotating Cutter and Blade System Which Works Smoothly Across Your Facial Skin Without Pain. Lets You Quickly and Easily Shave Away Unwanted Hair. ONE YEAR WARRANTY, 30-DAY MONEY BACK GUARANTEE – For 30 Days After The Date of Purchase, Return It Receive A Full Refund for ANY Reason. This Facial Hair Trimmer ONLY Sold by “RXF”,To Ensure Product Quality and After-sales Service, Please NEVER Buy From Other Sellers. Awesome Design, Compactness, High-quality and High-tech Materials for Beauty Hair Removal Allows you Quickly and Flawlessly Remove Hair in the Most Sensitive Places! Body Painless Hair Remover has a coating of 18 karats hypoallergenic gold. A high-tech rotating cutter head in Face Hair Removal will quickly remove hair from the body, cheeks, neck, face, and lips. The steelhead in Fashion Hair Remover does not have any direct contact with the skin (does not leave cuts on the skin). Painless Remover is great for all types of Skin and Tones. Womens facial razor does not cause irritation, redness even for the most sensitive facial skin. Ladies flawless hair remover is wireless, lightweight and portable. Touch Hair Removal is suitable for daily use. ONE YEAR WARRANTY, 30-DAY MONEY BACK GUARANTEE AND 24H CUSTOMER SUPPORT. For 30 Days After The Date of Purchase, Return It Receive A Full Refund for ANY Reason. The Finishing Touch Flawless Hair Remover That You Purchase Today Will Be Automatically Enrolled In The Guaranteed Program. Please Be Assured The Purchase. FLAWLESS & PAINLESS – The Flawless Hair Remover’s Stainless Steel Blades Removes Facial Hair Instantly and Painlessly from Lip, Chin. Make Your Skin Look Smooth and Radiant Which is Gentle Enough to Use Every Day and Save Your Time or Money for Waxing. missing parts. We will try our best to help you solve your problems. will be easy and flawless. 【GREAT FACIAL HAIR REMOVER】 Using Smooth Glide Technology, provide a close, comfortable shave even in sensitive areas. This women shaver can easily shave Lip, Chin, Neck, Face, Legs, Arms and all over your body. 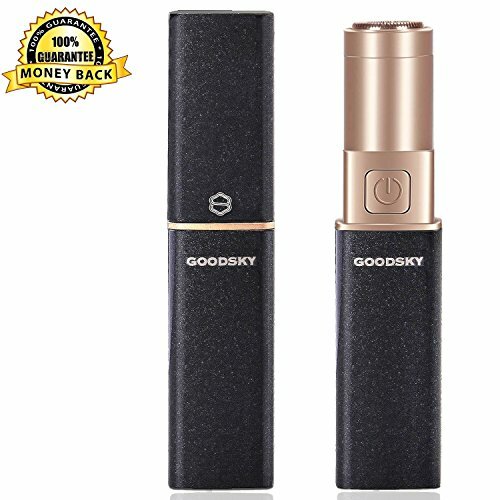 【CORDLESS&PORTABLE】 Cordless compact device perfect for travel – powered by AA batteries included with no need for charging cords. 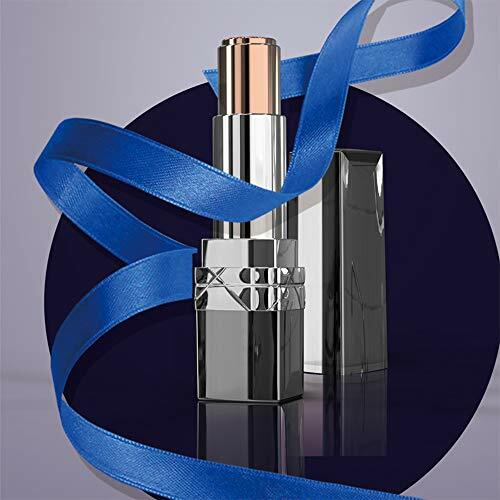 【PAINLESS,NO IRRITATION】The mini hypoallergenic foil can remove hair safely and effectively. Restore smooth skin, No Peach Fuzz, No Coarse Hair, No Irritation. 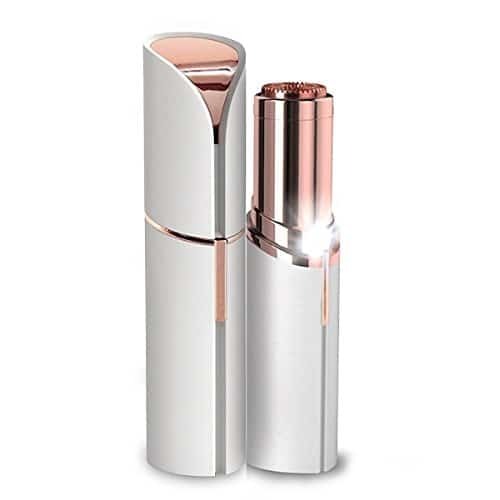 【ELEGANT LIPSTICK DESIGN】 Impressed with its beautiful and unique lipstick design. This Facial Hair Remover is packed with a pretty gift case. Ladies can take it and use it gracefully anytime and anywhere. 【100% LIFETIME GUARANTEE】 If the machine can not work fine or damaged, pls contact us. Lifetime worry-free product guarantee for every purchase from us. 2. Don’t use it when your skin is hurt, bleeding or damaged. 3.AA Battery is not included. 【Removes Hair Instantly & Painlessly 】:Women facial hair remover can removes hair from lip, chin, cheeks, arms safely and effectively. Restore smooth skin, No Peach Fuzz, No Coarse Hair, No Irritation. A must-have beauty tool for women! (Requires 1 AA Battery – Not Included. 【Stylish, Rose Gold Design】:Each hypoallergenic head is plated in 18K gold and safe on all skin types and tones,No more redness and irritation. this flawless hair remover is a discrete women’s shaver that hides seamlessly in a pocket for quick, easy use. 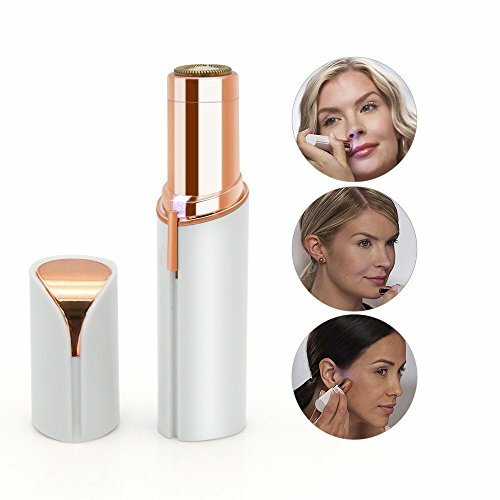 【Flawless Hair Removal as Seen on TV】:Facial hair trimmer builts in light, anytime and anywhere you can use the light to see all of the hairs on your skin surface so that you can remove it and achieve the results that you are aiming for. 【Superior Quality Assurance】:Along with provide a smooth finishing touch that helps to slow hair growth, Hypoallergenic, Dermatologist Recommended. Each hair remover is backed by superior craftsmanship and reliable customer service.